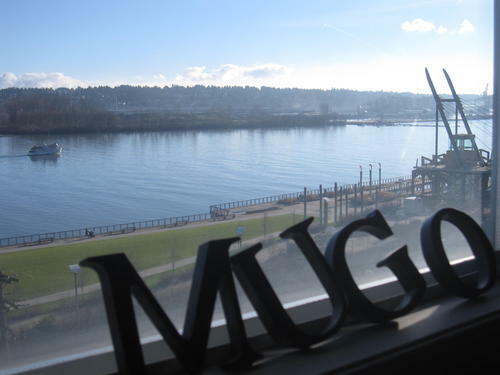 In early 2015, my company decided to trade in our downtown Vancouver office for a new Mugo HQ in downtown New Westminster (30 minutes outside of Vancouver)! Although the main motivation behind the move was to have a more central location relative to Mugonites’ homes, we’ve been very pleased with the surrounding area and amenities. When we were first surveying available office locations in downtown New Westminster, we met up with David Sarraf, who walked us up and down Columbia Street, speaking glowingly about the city’s revitalization and showing us the many buildings that he owns and has refurbished. When he showed us one of his offices with sweeping river views, we were sold. We soon met our office neighbours Techno Monkey Media, who gave us a warm welcome to the building, introduced us to a few others in the business community, and helped us with some unexpected internet connectivity issues. We then got acquainted with the Downtown New Westminster Business Improvement Association, which is a close-knit business community. We’ve learned a lot about the many new businesses that have come to New Westminster recently, and have been kept up-to-date on the various challenges, successes, and developments in the downtown area. And finally, we got introduced to some of the people from City Hall, who are a responsive and hard-working bunch. Whether the topic is the recently opened New Westminster Pier Park, hosting an event at the Anvil Centre, or the upcoming city-owned fibre optic network BridgeNet, people like Blair Fryer are hard at work improving the city and eager to talk collaboratively with businesses and residents about various initiatives. Blair also has all the good tips about stores and restaurants at River Market and where to get the best turkey sandwich. To top it all off, after almost 7 years of remote work, we finally met some of the doctors from one of our first clients: Royal Columbian Hospital in New Westminster. We’ve worked with them on a number of web projects, including the recent emergency department shift evaluation system. We’ve had a great year in New Westminster and look forward to many more!